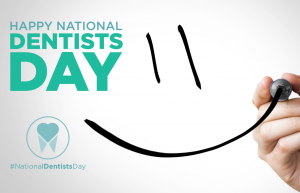 March 6 is National Dentists Day, so in honor of this observance we'd like to talk about how important your oral health is, as well as Dr. Jorge Montane's approach to dentistry. We'd also like to take a moment to recognize our amazing team of dental hygienists, dental assistants, and office staff. Without them, our practice couldn't operate nearly as well as it does. Fear of the dentist is unfortunately very common among both adults and children. It's understandable; no one likes to sit with their mouth open while someone works on their teeth. Plus, in the past, advances such as sedation dentistry and gentle, pain-free techniques hadn't been perfected yet, so going to the dentist could be a traumatizing experience. Nowadays, however, going to the dentist doesn't have to be a painful and frightening experience. Dr. Montane has earned the nickname "No Pain Montane" from his patients because of his extraordinarily gentle touch and his willingness to utilize sedation dentistry for patients who need or request it. This is why it's so important to visit your dentist regularly. Dr. Montane can monitor your oral health, check for oral cancer and gum disease, and catch problems before they become too severe. He can also help you obtain a more cosmetically appealing smile, through procedures such as porcelain veneers or teeth whitening. Dr. Montane loves being a dentist and helping his patients achieve beautiful and healthy smiles. He will work together with you to make sure your experience is as comfortable as possible, with the best outcome possible. If you are ready to schedule your dental appointment, call Montane Dental Care today at 510-795-0444. We serve patients in Fremont, Newark, Union City, and other parts of the Bay Area. How Long Do Dental Implants Take to Heal? What Is the Difference Between a Crown and a Veneer? How Do Porcelain Veneers Feel in Your Mouth? How Long Does It Take to Get Veneers Fitted? How Long Do Mini Implants Last? What Is the Best Way to Replace Missing Teeth? Disclaimer: The information throughout this dentistry website is not intended to be taken as medical advice. The information provided by Montane Dental Care is intended to provide general information regarding dental implants, cosmetic dentistry including porcelain veneers, smile makeovers, and teeth whitening, TMJ treatment for headaches, jaw pain, and neck pain, sleep apnea treatment for snoring, sedation dentistry, general dentistry including crowns, bridges, grafts, and routine cleanings, pediatric dentistry for kids, emergency dentistry, and more for residents of Fremont, Newark, Union City, Pleasanton, and nearby areas of California. This website is not intended for viewing or usage by European Union citizens. If you are interested in finding out more, please contact our dental clinic today for a personal consultation. Read our ADA compliance disclosure.